00:55:00 Makes 8 servings, 1 stuffed chicken breast each. Makes 8 servings, 1 stuffed chicken breast each. 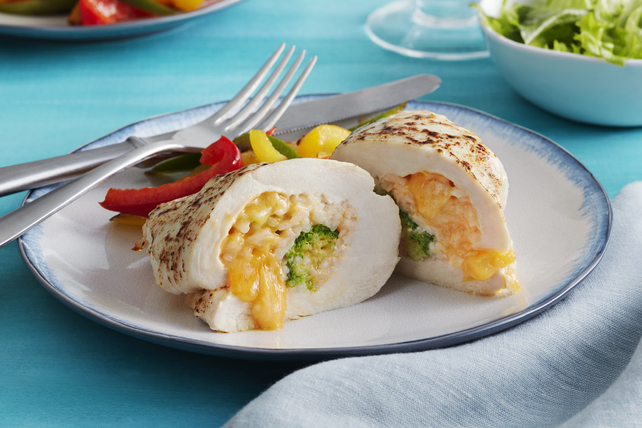 A delicious filling of two kinds of cheese, rice and broccoli keeps chicken breasts moist and flavourful, while a drizzle of ranch dressing finishes things off. Served with steamed veggies and a tossed salad, these stuffed chicken breasts are sure to become a weeknight favourite. Preheat oven to 350°F. Mix cheeses, rice and broccoli until well blended; set aside. Place 2 of the chicken breasts in large freezer-weight resealable plastic bag. Pound chicken with the side of a heavy can, rolling pin or meat mallet until chicken is 1/4-inch thick. Remove chicken from bag; set aside. Repeat with remaining 6 chicken breasts, two at a time. Place chicken, top-sides down, on large cutting board. Spread evenly with stuffing mixture. Starting at one of the short ends, roll up each chicken breast tightly. Place, seam-sides down, in 13x9-inch baking dish. Drizzle evenly with dressing. Bake 35 to 40 min. or until chicken is cooked through (170°F). Serve with steamed vegetables and a side salad tossed with your favourite Kraft Dressing for a simple, yet impressive, meal the next time you entertain. Serving Size Makes 8 servings, 1 stuffed chicken breast each.